Kotaro Kiyomiya hit his 109th home run as a high schooler on Saturday, extending his unofficial Japanese record. The Waseda Jitsugyo High School senior was with Japan’s under-18 national team in a practice game against a university squad in Chiba Prefecture. The young Samurai Japan squad will take part in the U-18 World Cup held in Thunder Bay, Ontario, from Sept. 1 to 10. Japan has won four silver medals in the competition, which is now held every two years. Although on the radar of Japanese and American pro scouts, Kiyomiya is expected to attend Japan’s Waseda University, as his father did, or perhaps a school in the United States, where he could turn pro much earlier. 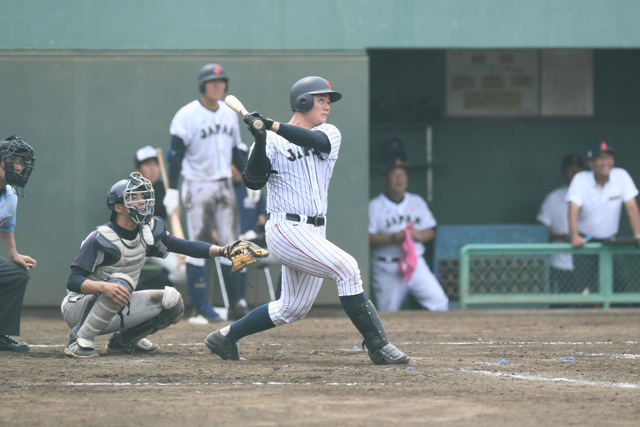 If Kiyomiya were to attend an American university, he would be eligible for Major League Baseball’s amateur draft in June 2020, when he is 21, and could turn pro immediately after.